Catrin Pugh was a normal young girl with her dreams and life in front of her, until in an instant everything changed forever. 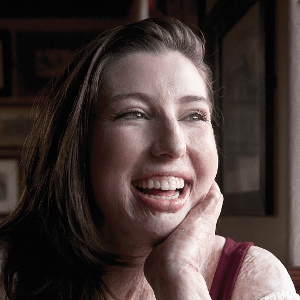 In 2013 she sustained horrific burn injuries but has beaten all the odds to not to only astonish medical staff, her family and her friends with her resilience but to deliver some of the most inspirational speeches you will ever hear. Catrin grew up in the small town of Wrexham, North Wales in a close and loving family Catrin was extremely confident and self-assured. Aged eight she joined a weekend performing arts school where she learnt drama, dance and singing, and discovered early on that the stage was a place she could call home, winning competitions throughout her teens in all disciplines. Her other passions revolved around activities with the family. Catrin especially loved the outdoors with skiing, which she would enjoy once a year on the annual family trip becoming her favorite pastime. Something she would do whenever she could! Catrin loved school and excelled in most areas. When she got to Sixth form to study for her A levels, she made the decision to study Music, Drama and Media. On leaving school Catrin Pugh, like many other young people, wasn’t quite sure what she wanted to do. So she decided to take a gap year before taking up a place at Manchester University to read Events Management. Her gap year was to be skiing led and she going to work a season in a ski resort to begin with seemed like the obvious choice. So at the age of 18, she spent five months working in a hotel in Alpe D’huez, France, and had an amazing time meeting new people and gaining new life experiences. This time away made Catrin want to continue travelling around the world and she was looking forward to getting home to begin planning her next adventure. Sadly that journey home in April 2013 turned her life upside down and changed her forever. Catrin Pugh was involved in a serious coach crash on the side of the mountain which left the driver dead, many passengers injured and Catrin fighting for her life. The explosion had set her on fire. A friend pulled her off the coach and was able to put the flames out. She then spent two hours lying on the roadside drifting in and out of consciousness, all the while not knowing that 96% of her body had been burnt to the third degree. Eventually, she was airlifted to a French hospital and placed into an induced coma. Five days later her parents agreed to have her flown back to the UK, despite the chances of surviving the journey being very slim. Against the odds she made it, and was rushed to Whiston hospital, Merseyside, where her parents were told her chances of survival were 1 in 1000. She remained in ICU and underwent hundreds of operations and procedures, fighting to survive constantly, and somehow always pulling through. After three months in an induced coma, she finally awoke to find she couldn’t speak, couldn’t move and couldn’t walk. Catrin could not understand how someone could go from being absolutely fine to ending up absolutely wrecked in the blink of an eye. One moment could change everything, and in her case, leave her scarred and disfigured forever. After a further five month stay on the burns unit, a lot of tears, trauma and hard work, Catrin was finally allowed to go home just in time for Christmas 2013. But this was just the beginning of a long and arduous rehabilitation process that is still ongoing today. 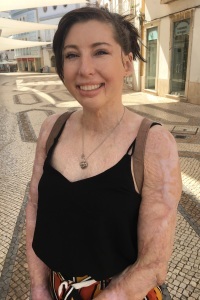 With sheer determination, constant motivation and fighting through unbearable pain, Catrin has defied the odds and can proudly say that she is one of the only adults to survive 96% burns in the world. Catrin has worked tirelessly to learn to walk, use her hands again and try to regain a somewhat ‘normal’ life, all with a smile on her face. Only two years after the accident, Catrin went back to the French Alps, where her life had changed so dramatically and got back to doing something she loved to do. She ski’d thus proving that with enough will to succeed and a positive attitude, the outcome can be great. Catrin has gone from being a victim to a survivor, and is now is a thriver. She uses he own experiences and survival techniques to help others. Whether that be to inspire, improve motivation, deal with trauma or self image and everything in between. 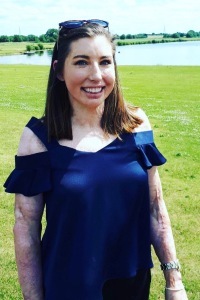 Catrin Pugh is an ambassador for The Katie Piper Foundation, Changing Faces and The British Association of Skin Camouflage, all charities that help make the World a better place for people living with disfigurements. She has spoken on behalf of these charities and various events. We booked Catrin Pugh as our inspirational keynote speaker of the day who agreed to share her extraordinary story with us. In a presentation that was humbling, heart rending and at times quite shocking she described her incredible recovery and gave us an insight into the daily challenges she had faced. Catrin did this with great eloquence, splashes of humour and a positive approach that has served her so well. It is a miraculous story and Catrin tells it very well. She came to speak to a room full of NHS GP practice managers who have seen it all – or thought they had. She made a huge positive impact on us all and I would not hesitate to recommend her. Catrin was asked to speak on behalf of The Katie Piper Foundation at our Key Supporters’ Lunch at The House of Lords as one of three speakers. The audience included corporate sponsors, medical professionals and other burn survivors; about one hundred people in total. Due to an emergency one of the main speakers could not attend at the last minute and so Catrin was asked to step in. She covered all the key messages from the other speech while appearing completely relaxed. Her professional, calm manner, combined with her warm and engaging speaking style, made her extended speech a huge success. She was able to engage with the diverse audience on many different levels. Catrin’s talent and skill, combined with her inspiring personal experiences, make her a unique and invaluable speaker. I saw Catrin speak at The Ideal Home Show at Christmas 2015. 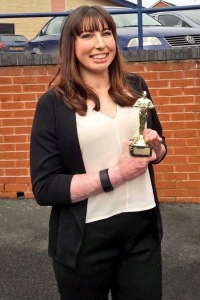 She was interviewed by Katie Piper and spoke about what confidence meant to her. She spoke in front of an audience of around 70 people seated and many people who were walking by as the show was happening. 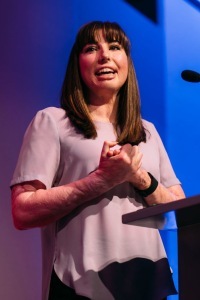 Catrin spoke clearly, and confidently, engaging with audience with her body language and tone and talked about personal experiences, and emotions and the audience were visibly moved and interested in what she was saying. At the end of the interview everyone in the audience stood up and clapped, something I hadn’t seen them do with any of the other speakers.